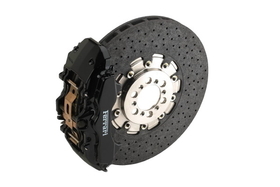 Carbon ceramic brake discs are used on sports cars from brands such as Ferrari. TURIN -- New partners Brembo and SGL Group predict that demand for carbon ceramic brake discs will rise sharply once they find ways to reduce the high cost of a component. To meet this demand, recently formed Brembo SGL Carbon Ceramic Brakes plans to boost its annual disc output to 500,000 from 100,000 in the next 18 to 30 months. “At the current cost, carbon ceramic brake discs have a potential global market of roughly 1 million vehicles a year. 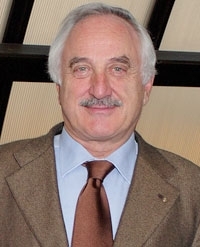 Reaching the cost target we have in mind, means increasing the potential reach to 2.5 million annual sales,” Brembo Chairman Alberto Bombassei told Automotive News Europe in a phone interview. Bombassei declined to say how much a carbon ceramic disc brake costs to produce. Supplier sources say it is about four times more expensive to make them compared with a traditional cast iron disc. “With a new manufacturing process, we aim to decrease the cost factor to about two to two and a half times a traditional disc,” Bombassei said. Carmakers charge customers 10,000 euros to 15,000 euros to add the special feature, which is found on high-performance models. Brembo supplies the discs to Aston Martin, Daimler, Ferrari, General Motors (for the Chevrolet Corvette ZR-1) and Lamborghini. SGL’s customers include Audi, Bentley, Bugatti and Porsche. The partners hope that by lowering the cost of carbon ceramic discs they will become a suitable option for higher-volume premium models. Brembo Chairman Bombassei wants to make carbon ceramic brakes more affordable. In late May, Italian brake maker Brembo S.p.A and Germany’s SGL, which makes carbon-based products, merged their carbon ceramic brake disc operations. The new company, which employs about 350 people, plans to build more than 100,000 discs this year and have sales of 70 million euros. 3. Economy - they are much lighter. On a high-end sports car, using carbon ceramic brake discs lowers the vehicle’s weight by 20kg to 22kg. A lighter vehicle burns less fuel than a heavier one. This advantage could appeal to automakers as they race to lower fuel consumption and emissions ahead of tougher CO2 rules that take effect in 2012.